Layer two 18-inch-long pieces of foil on top of each other. 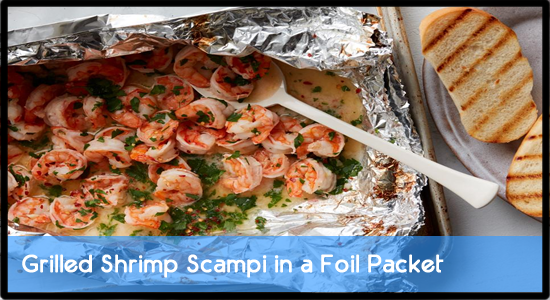 Put the shrimp, butter, wine, garlic and lemon zest and juice in the center of the foil. Sprinkle with the red pepper flakes, 3/4 teaspoon salt and a few grinds of black pepper. Bring the long sides of the foil together in the middle and fold them over each other to seal. Fold each of the short sides up, making sure the packet is completely sealed. Place on the grill and cook until the shrimp are fully cooked and the sauce is bubbling, about 9 minutes. Stir in the parsley and serve over pasta, rice or grilled bread. 1 Response to "Grilled Shrimp Scampi in a Foil Packet"